Bridgeport Mayor Joseph P. Ganim is running for governor not despite his past felony convictions — but, he said, in part because he wants to share with Connecticut residents the lessons he learned while behind bars.He also thinks his story of personal and political perseverance is an inspiring example of the redemptive possibilities afforded by a “second-chance society” state. Ganim, who is seeking the state Democratic nomination for governor, did not talk on air about the 16 counts of racketeering, extortion, racketeering conspiracy, bribery, mail fraud and other felony charges that landed him in federal prison after his first stint as the youngest mayor of the state’s largest city from 1991 to 2003. And unlike in past WNHH interviews, he didn’t focus on interstate highway tolls, legalizing recreational marijuana, MGM casinos, plans for revitalized urban economic development, or any other policy initiatives he hopes to pursue if the people of Connecticut elect him governor in 2018. Rather, Ganim spent the hour talking about the personal and professional challenges that he faced during his encounters with the criminal justice system that he said are common to most people who are convicted of a crime, serve time in prison, and then try to reintegrate into society and into their families after being released. He said he hopes to leverage his public profile towards demonstrating for all Connecticut residents how much the formerly incarcerated are capable of contributing to society. “I hope [my story] forces people as humans to understand and recognize that people make mistakes,” he said. He said his story can help people in Connecticut work towards reducing the barriers that the formerly incarcerated face when trying to reintegrate into society. And if that public civics lesson also helps land him in the governor’s mansion later this year? He’ll take it. During his first 12-year stint as the mayor of Bridgeport, Ganim recalled, he experienced a sinking feeling when he saw a familiar face arrive at his office at seven in the morning on Three Kings Day.That unexpected guest was the head FBI agent for the Bridgeport region. The agent announced that he had a warrant to search Ganim’s home, and that Ganim needed to leave the office and come with him. At the time, Ganim was married, had three young kids, and was living in the Black Rock neighborhood of Bridgeport. Ganim recalled telling his wife that his alleged crimes had nothing to do with her, and that she and the children should wait at his brother’s home as the FBI conducted their search. What they found ultimately helped prove that Ganim had committed a variety of municipal corruption felonies while serving in office, including taking in $500,000 in kickbacks from city contractors that were interested in working in Bridgeport. Ganim’s youngest son was born in the middle of the controversy. Reporters bombarded him and his wife immediately after the birth not with questions about their new son, but about the alleged crimes he had committed while in office. “It was a rough time coming out of the hospital,” he said. Ganim said that one of the biggest questions he had to wrestle with during the federal investigation and trial was whether or not he should resign as mayor. Ganim decided that he could, and that he still had enough popular support to maintain political legitimacy even during the investigations. He recalled getting ambushed by a group of city councilmen who said that they wanted to meet with him to talk about the budget, but instead came to his office and asked him to resign. They had invited the press and had organized a press conference that Ganim refused to attend. Ganim did not resign until April 2003, two weeks after he was convicted of the 16 felony counts for which he would be sentenced to nine years in prison. Former Providence Mayor and Ft. Dix resident Buddy Cianci. Ganim wound up serving seven years of his nine-year sentence. Most of his time behind bars was spent at the Fort Dix Federal Correctional Institution (FCI) prison camp in Fort Dix, N.J.Ganim said that he remembers the despair he felt when he first entered the prison and saw the barbed wire fences and armed guards. When Ganim got to his bunk, he slunk into the top bed, hoping to make as little an impression as possible in his new cell. Then he met the man who shared the lower bunk bed. The man said that he was from New Jersey, and that he was “short,” meaning that he was almost done with his sentence. Ganim learned that the man had only two years left on a 15-year sentence. Ganim said that this man was living his life, had his act together, was helping people, had a game plan for what he was going to do when he got out. Ganim said that he kept himself plenty busy during his time at Fort Dix. As a lawyer, he was highly sought after by his fellow inmates who needed help filing legal briefs. He said that he worked as a mentor, taught reading, and led a real estate course on how to buy one’s first home. He also became a certified personal trainer while behind bars. “You think these biceps are fabricated,” he joked. Ganim also said that former Providence Mayor Vincent “Buddy” Cianci, with whom Ganim was quite close, also served time at Fort Dix. Ganim said that one of Cianci’s former cellmates ended up in the same camp as Ganim. He told Ganim about the piles upon piles of letters that Cianci received each day from former constituents who missed him and hoped that he was doing well. “I got mail,” Ganim recalled, “but I didn’t get mail like [he] described Buddy getting mail.” He said that he felt that the people of Bridgeport had forgotten him. He also noted that Cianci, after getting out of prison, ran for mayor of Providence and lost, in no small part because of changing demographics. Ganim said that Cianci’s older Italian-American constituency was no longer as politically powerful as it once was, and that Cianci had failed to appeal to a younger Hispanic constituency that now dominated the city. Ganim said that when he got out of prison in July 2010 and was contemplating a return to public office several years later, he would not forget the lesson of the power of changing demographics. Ganim at the WNHH studio in August 2017. After returning home to Connecticut in 2010, Ganim laid low. He lived at his family’s Christmas tree farm in Easton. He worked as a legal assistant for his family’s law firm in Bridgeport. (Because of his various felony convictions, Ganim was stripped by the State of Connecticut of his law license. Ganim appealed the decision, but the Connecticut Supreme Court ultimately refused to restore his license in 2015. 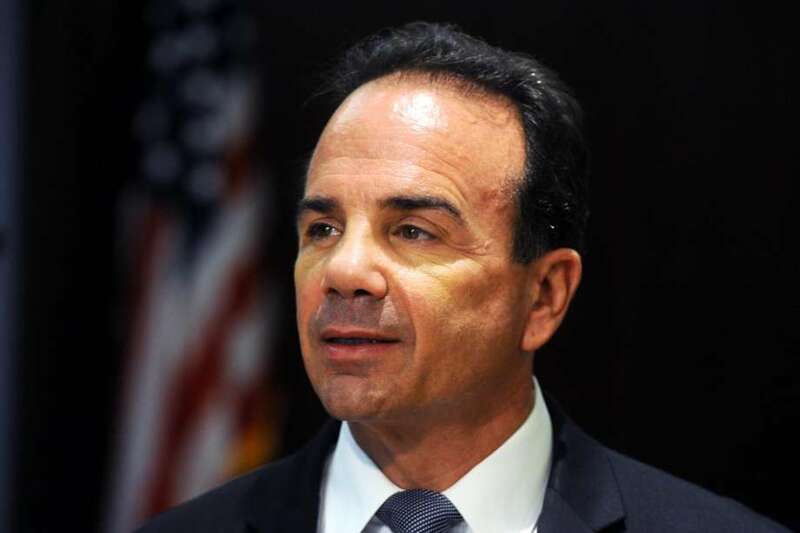 )Ganim also said that, upon returning to Connecticut, he helped his family law firm administer an annual scholarship fund to help Bridgeport high school students afford to go to college. He remembered visiting various African-American churches around town as he was working on the scholarship. “People were saying to me: ‘Joe, would you think of running again?’” he said. Around Christmas in 2014, Ganim sat down with his children and talked through what they thought about whether or not he should do that. One child was enthusiastically supportive. One was more hesitant and reflective. When Ganim told his children that another run would mean high-profile stories about his past misdeeds, his children told him that that did not bother them. They had already heard the worst that their father’s critics had to say about him. If he wanted to run, and thought he could help the city of Bridgeport, he should do it. Ultimately, he said, he knew that he wanted to do this, that he had enough popular support to warrant a run, and that his family was on his side. During the 2015 mayoral election in Bridgeport, Ganim secured the Democratic Party nomination on a platform that emphasized urban economic rejuvenation, law and order, and the “second-chance society” principle that people who have spent time behind bars deserve another shot at being able to contribute to society. After incumbent Bill Finch’s campaign missed a key filing deadline and the candidate decided to drop out of the race, Ganim coasted to victory. On Dec. 1, 2015, 12 years after he left office in disgrace, Ganim was sworn in as the new (and current) mayor of Bridgeport. “Criminal Justice Insider” airs every first and third Friday of the month on WNHH FM at 9 a.m. and 5 p.m. Listen to the full interview with by clicking on the audio player or Facebook Live video below. “Criminal Justice Insider” is sponsored by Family ReEntry and The Community Foundation for Greater New Haven.